warrior, dark-knight, thief, shadow, invoker, illusionist, necromancer, shaman, and bard. Drows are descendants of the elves, sharing the same ancestors, but have evolved into a darker and much more sinister version of their more forest oriented counterparts. The Great War led to the defeat of the elves and legend tells that much of their loss was attributed to the treason of one elf in particular, a female. Her treason was unexpected to be as effective as it turned out to be, hoping only to get her own father killed by allowing more orcs into the city of Greginsham - and she did not join her brethren on the retreat. Instead, she and a few accomplices moved underground and remained below the surface for the rest of their days, never returning to the side of those they betrayed. Over the ages, a new race and society of elven heritage slowly evolved deep below the surface. Unlike the surface elves, the drow are dark-skinned from their lack of time spent in sunlight, although they often share the same white hair. Because of the drow races's conception by a female, theirs is a matriarchal society, the females always occupying the highest positions of authority and considered the better warriors. Drows have grown very alert and dextrous from their time spent in the dangers below the surface of Serin, although have less intellect than their forest cousins. 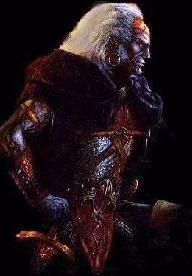 The drow are very set on their goals, ruthless and willing to attain them at any cost. Drows do not care to spend much time talking to those less intelligent than themselves, and are content to remain in their caverns rather than go above ground. They have a distinct love of spiders. Drows hate humans intensely for being the race that started the Great War and dooming them to retreat below ground, and refer to them with words such as 'filth' and 'vermin'. They are untrusting but remain intelligent enough to know who will make an ally and who they decide is an enemy. They rarely trade with other races outside of their own, other than the minimum they need. Like their elven cousins, drows excel in magic, and are also adept at thievery. However, drows have turned their magic to the dark arts, and must stay evil to use spells. Drow dark-knight - Auspice of Ilythir. Drow dark-knight - Silver Spider. Drow shadow - Poison Mastery. High intelligence permits a drow to learn new skills and spells in just one practice session. Ten spare practice sessions may be converted into a training session and used to increase their health. Attacking a drow with weapon made from mithril will NOT cause extra damage. Exploiting vulnerabilities depends upon the attack a weapon does, not on the metal the weapon is forged from. Projectile weapons like arrows are an exception. Because of their size and agile nature, drows are hard to trip successfully. Low wisdom and constitution makes drows poor at blocking attacks with a shields. Because poor strength translates into poor parrying, consider maintaining combat style superiority for dodging. Autosneak makes it difficult for enemies to follow you when you flee from them. This can be a lifesaver and is infuriating for any aggressor, and makes it easy to flee and re-engage for 'free rounds' from additional murders.